Theres obviously not a lot of mystery surrounding Aston Villa football clubs most commonly known nickname of Villa is there ? It is though listed in some places as being The Lions but we cant seem to find any historic references as to why that would be, we're assuming its maybe something to do with the Lion on the badge but we can't be sure. There is also a little bit of confusion about their other main nickname, some people spell it as Villans and others as Villains, again though no prizes for guessing how that nickname came about !! "The Villains of Div 1. 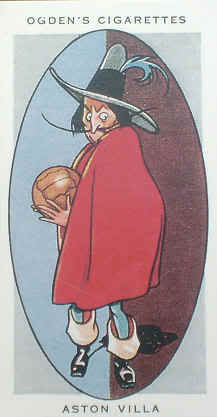 This nickname we presume is derived from the clubs own name. Founded in 1874, this club was one of the original sixteen members of Division 1, and has achieved many outstanding successes since then." "Aston Villa, one of the most famous and successful clubs since the introduction of League football, started from Aston Villa Wesleyan Chapel and it was in this way that they came by their rather curious name. Known as The Villa they are always depicted as a picturesque Villain, an appropriate representation of one of the most formidable teams in the game. They have, however, always cultivated a classical style which is the envy of their rivals and which has won them all the honours in the game. They share with Blackburn the record of having won the Cup 6 times." 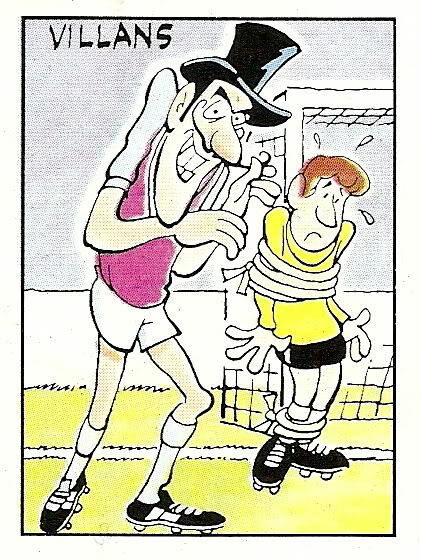 The cartoon above is Paninis take on the Aston Villa football nickname, this character was part of the Panini 86 sticker series. Again, this sticker can be purchased on our Footybits site where it has been mounted in a clear fridge magnet.